OK BlackBerry Storm followers, we've got some new news here. 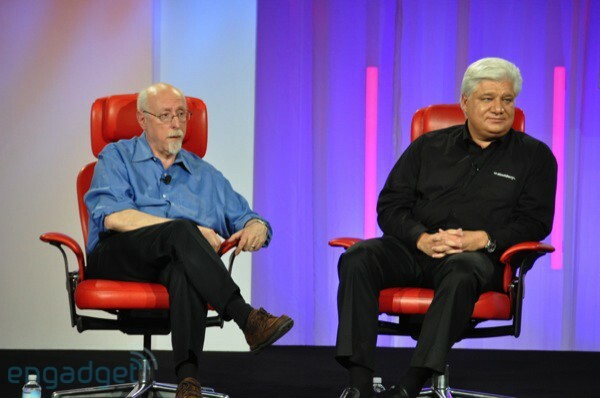 RIM's Founder and Co-CEO Mike Lazaridis was just on stage at D7 and told Walt Mossberg and the crowd that "SurePress is here to stay" (big ups to Engadget for live blogging). We had heard that SurePress would be a thing of the past on the next gen device, but haven't really known exactly would that would mean. We heard previously that TruePress could be the new name and that there would be some sort of physical feedback at work, but the early Storm 2 photos and review by Engadget showed a display that looked less than clickable. But according to the head honcho it sounds like we'll see SurePress in one form or another on the next Storm. Most people like the concept of seperating navigation from confirmation but in practice on the original Storm it tends to slow you down more than it aids you (especially while typing). It is still unsure what exactly SurePress will mean on the Storm 2 (be it a physical screen click or something under the screen that registers pressure or something entirely different) but with all the rumors flying around, we are sure the real answer will be known sooner than later.